Nestled among fields of corn and soybeans, this dynamic 65-acre garden is set in the rural Pee Dee region near Lake City, South Carolina. Moore Farms Botanical Garden is the perfect learning environment. They also host classes and professional workshops. 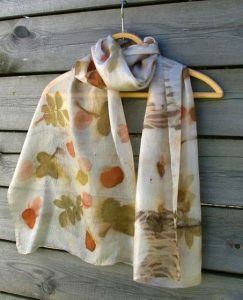 Join Caroline Harper at Moore Farms Botanical Garden on Thursday, September 28, 2017 for an artful day in the garden at a workshop creating Eco Print Scarves. Eco printing is basically a direct contact printing method, drawing out pigments from plants to make interesting and often surprising marks on protein (silk) fibre. 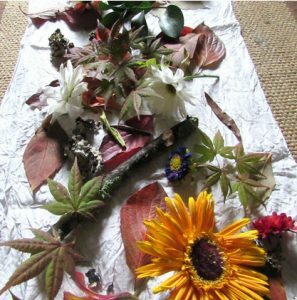 In this class accomplished artist Caroline Harper will show you how to create 2 silk scarves with foraged leaves, flowers, vegetable skins and other objects found from the garden. This entry was posted on Monday, September 18th, 2017 at 10:18 am	and is filed under Art, Culture, Drive I-95, Entertainment, Nature, South Carolina, Special Event, United States, USA. You can follow any responses to this entry through the RSS 2.0 feed. Both comments and pings are currently closed. 30 mySQL queries executed in 0.417 seconds.